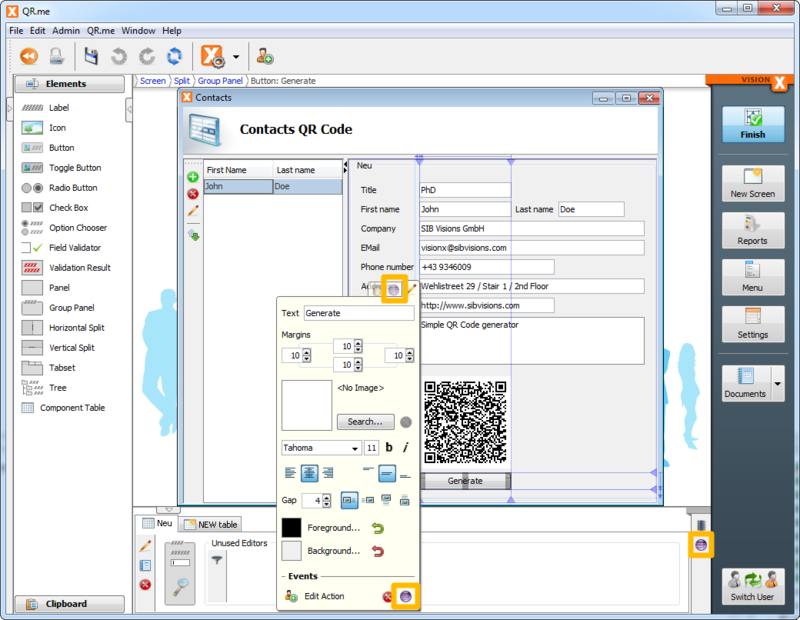 The first video shows our record navigion similar to Oracle Forms and of course, we have a solution for Forms' Enter query mode. Great news for all VisionX users! The current update release 2.0.121 is available for download. Please check your download area. It contains current JVx, ProjX libraries and source code. If you miss some features after upgrading, please contact our product support because previous versions provided features without valid license. If the features are already licensed, no worries. We have a product and feature overview for you. We have a really cool new feature for you. It's comparable to repeating frames of Oracle Forms. It's more or less a free-form table. Every row is a panel with custom components and every row shows the same components but bound to our DataBook. We use the name ComponentTable for the control. It'll be available in one of the next VisionX nightly builds but will be limited to our OracleForms license option. We have a new feature for you! It's an API to generate QR codes. 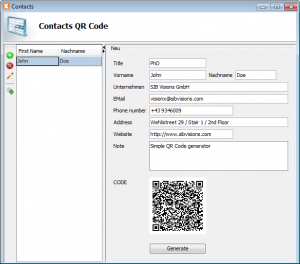 The API is available in ProjX and you can easily create custom Contact, Phone number, Text, E-Mail and Geo Location QR codes. 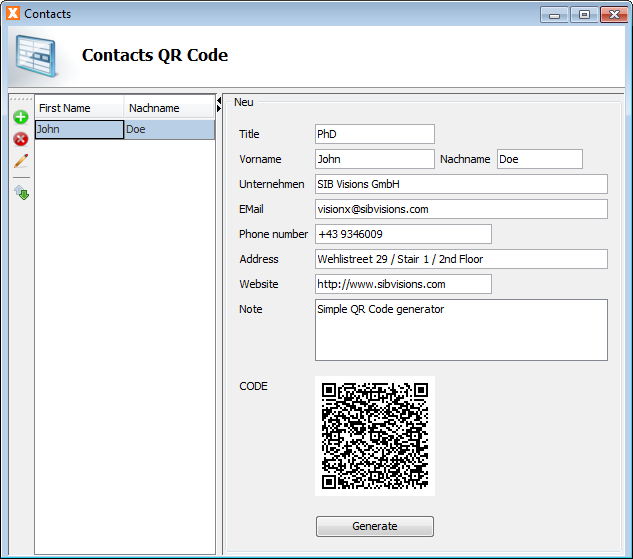 We've some new actions for QR code generation in VisionX to easily use the new API. It's a cool new feature and we've a new example application in our Solution store, but be careful because you need VisionX 2.0.85, or newer, for this feature. 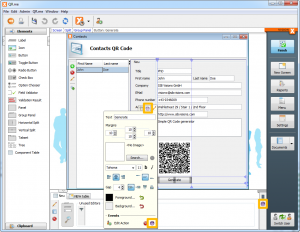 Create your own QR codes in seconds! If you are Liferay User and Vaadin Portlet developer, you know that Liferay has Vaadin bundled. If you develop a Vaadin portlet, you should use the bundled Vaadin version, otherwise it'll be a problem after a deployment. We solved the problem in JVx' VaadinUI by extending Vaadin. Our implementation allows different Vaadin versions independent of Liferay. Some days ago, Matti Tahvonen posted an article about Using "self-contained" approach to package Vaadin portlets. This is an interesting article because it's exactly what we tried to do and we thought that Vaadin developers have a better solution for the problem! And of course, their solution is better than ours But we are like copy cats and we changed our solution because it reduced code and made it easier for us to maintain our codebase. Our idea was not far away from the recommended solution, but we did too much. To find out what Vaadin did in their archetype, we followed their posted instructions. We found two steps that could be ignored. The first step was the creation of a custom maven profile because it was possible to add all properties to the pom.xml of the project. The second step was the configuration of the profile in Eclipse. Not needed if properties were added to pom.xml. To be honest... our solution contained a little bit more code but it worked. We've used our new knowledge to improve our solution, because it should be possible to use "self-contained" and "shared" approach without additional source code. We introduced a context parameter to switch between modes. Vaadin could do the same, but currently it's not implemented. Our new solution is as simple as the original Vaadin source code and the most important thing is that it works with our ant build. Twitter4j is available via git and after cloning and switching to 4.0.1 everything was available. I tried to import the maven project with Eclipse (Kepler) and got many problems because of missing libraries. WTF? Shouldn't maven solve all dependency problems? I didn't try to fix problems with Eclipse because it could be a maven plugin problem. So I tried maven itself with jdk 1.5 and some minutes later I got other exceptions because Twitter4j source was written with Java 6 syntax (@Override with interface methods). So I had to use Java 6 with 1.5 target option... After modifying pom.xml of twitter4j-core, the build had another problem: All test cases failed . So I had to use the command-line property -Dmaven.test.skip=true to ignore unit tests. Finally I got my 1.5 compatible Twitter4j library. But it was an awful task because maven bundled with Eclipse didn't work as expected. It's horrible if tools that should save time, waste time. I still don't like maven. IMHO it's still to complex compared to other build tools. A build tool shouldn't be as complex as developing software. Nowadays everything has to work with our IDEs, but what happens if it doesn't? I'm a researcher and love solving problems but is it that complex to keep things simple? Software has to be simple to help us and we - developers - have to write simple software/frameworks/libraries. Instead of creating simple software, many developers try to write millions LoC. Don't do that because no one can handle such code-bases in the future.